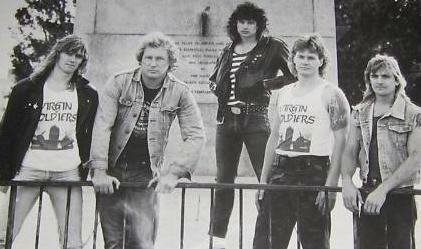 Virgin Soldiers (1980-1991, 1994) is a Heavy Metal band from Melbourne, Victoria, Australia. he original membership of Mick Lodge (bass; later replaced by Ashley Robertson of Betrayer), Rob Boundy (drums; later replaced by Paul Fernando), Chris Farley (guitars; of Betrayer), Geoff Marguis (guitars; of Betrayer) and Steve Williamson (vocals) released the self-titled Virgin Soldiers EP (1987) and Watching the World (1990) before busting up the year later. They reformed briefly in 1994 but broke up within the year again.